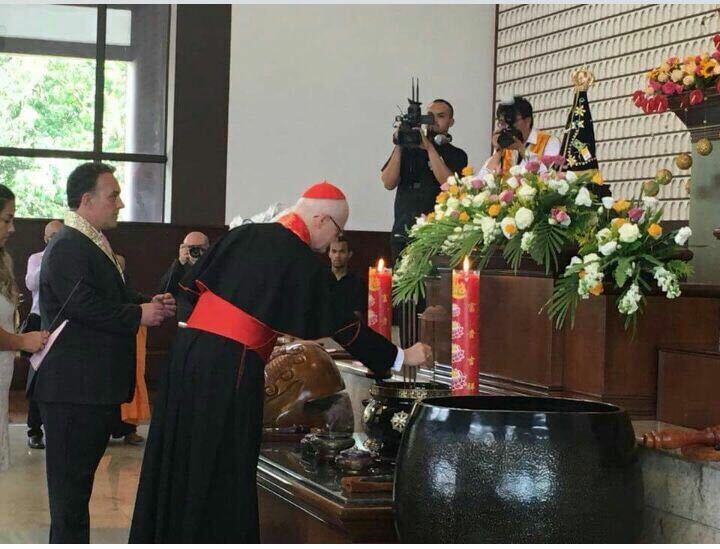 False Ecumenism continues: The Virgin and Buddha venerated at the SAME time! LOOK AT THIS FOR HERESY! 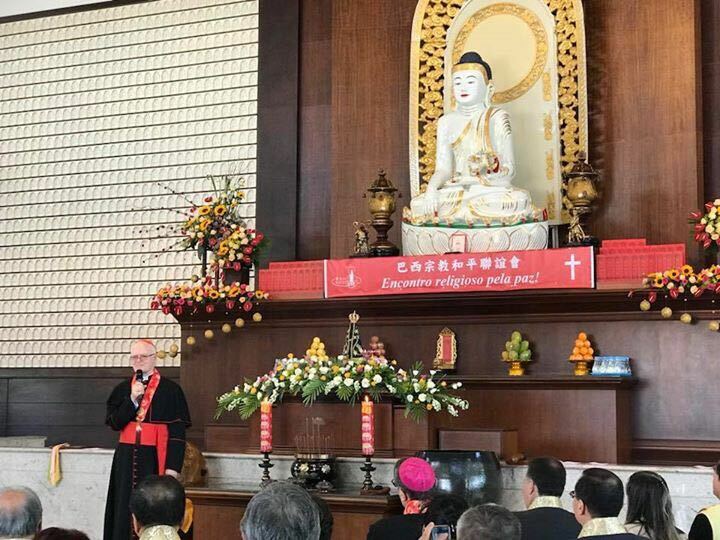 CARDINAL SCHERER ATTENDS A CEREMONY TO VENERATE THE VIRGIN MARY AND THE BUDDHA AT THE SAME TIME – AND GUESS WHO GETS SECOND PLACE! THE CARDINAL AND ARCHBISHOP OF SAN PABLO, SER ODILO SCHERER, TOGETHER WITH MONS. JOÃO BOSCO BARBOSA, BISHOP OF OSASCO AND PRESIDENT OF THE NATIONAL COMMISSION FOR LIFE AND FAMILY OF THE CNBB, THE REDEMPTORIST RECTOR OF THE NATIONAL SHRINE OF APARECIDA, FATHER JOÃO BATISTA DE ALMEIDA, AND A DOZEN PRIESTS, PARTICIPATED IN A CEREMONY IN WHICH THEY PRAYED WITH BUDDHISTS AND BOTH IMAGES WERE HONOURED. WHAT CONCORD CAN THERE BE BETWEEN CHRIST AND BELIAR? WHAT CAN THE FAITHFUL AND THE INFIDEL SHARE? WHAT AGREEMENT CAN THERE BE BETWEEN THE TEMPLE OF GOD AND THE IDOLS? AT THE FEET OF BUDDHA. 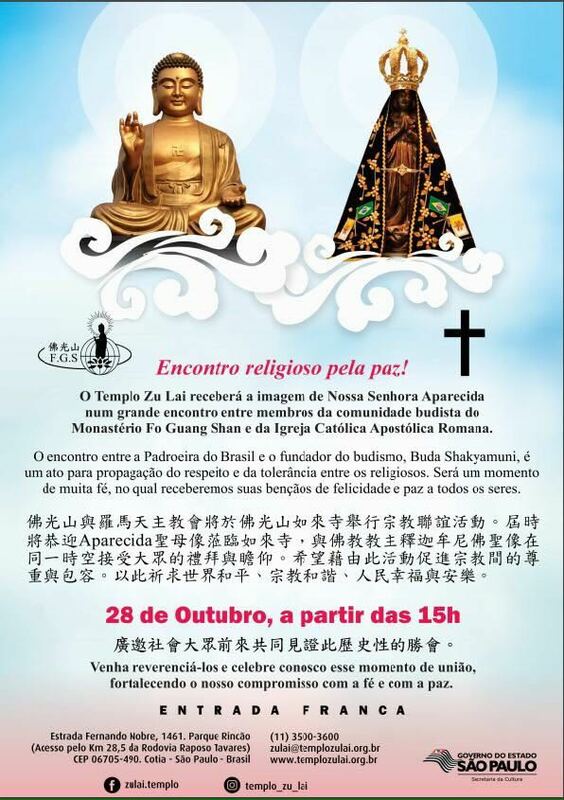 AFTER APPEARING IN A SAMBA SCHOOL IN THE MIDDLE OF THE CARNIVAL AND BEING “HONORED” BY BEAUTIES LIKE PRETA GIL , IN FULL 300 YEARS OF COMMEMORATION OF THE IMAGE OF OUR LADY OF APARECIDA, SHE HERSELF WAS PLACED IN AN INTERRELIGIOUS EVENT LAST SATURDAY , AT THE FEET OF BUDDHA! THE POSTER OF THE EVENT IS ELOQUENT. SIDE BY SIDE, THE BLESSED MOTHER OF JESUS CHRIST AND BUDDHA. EQUAL. EQUAL. BELOW, THE WORDS OF THE POSTER DO NOT ALLOW ALTERNATIVE HERMENEUTICS: “COME REVERCENCE” . PHOTOS AND VIDEOS OF THE EVENT ARE EVEN MORE SCANDALOUS. CARDINAL ARCHBISHOP ODILO SCHERER, TOGETHER WITH THE DIOCESAN BISHOP OF OSASCO, BISHOP JOÃO BOSCO BARBOSA, PRESIDENT OF THE CNBB NATIONAL LIFE AND FAMILY COMMISSION, THE REDEMPTORIST RECTOR OF THE NATIONAL SHRINE OF APARECIDA, FR. JOÃO BATISTA DE ALMEIDA, AND A DOZEN CLERGYMEN, ALL SUITABLY CLAD IN THEIR CASSOCKS, GIVING PRESTIGE TO THE BLASPHEMOUS MOMENT. 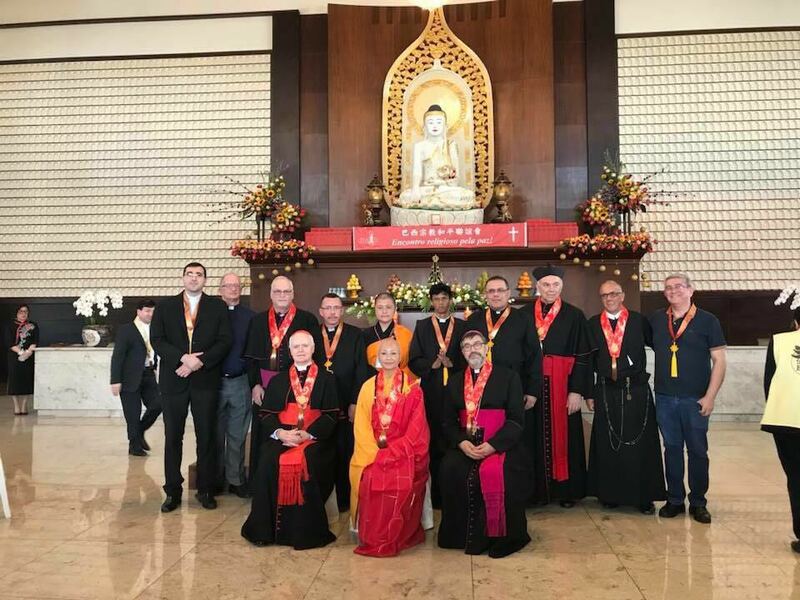 INCENSE OFFERED TO THE BUDDHA BY THE HANDS OF THE BISHOPS, THE IMAGE OF APARECIDA PUT UNDER BUDDHA, PRAYERS TOGETHER … THE MARTYRS OF ALL TIMES OF CHRISTIANITY ASHAMED, THE MOTHER OF CHRIST LOWERED, AND BELOW BUDDHA! THROUGH SOCIAL NETWORKS, FAITHFUL DISMAYED PROTEST, INDIGNANT WITH SUCH IMPIETY. AFTER WE RECEIVED DOZENS OF DEMONSTRATIONS, WE RESOLVED, TOO, TO JOIN IN THEIR VOICES TO REDRESS THE BLESSED VIRGIN, SO IRREVERENTLY OUTRAGED BY SUCH RELATIVISM. LET US PROSTRATE OURSELVES BEFORE THE HOLY IMAGE OF OUR LADY AND PRAY, ASKING FORGIVENESS FOR SUCH CONFUSION. THE NATURE OF THE EVENT IS VERY MUCH THE PURPOSE OF A MEETING FOR PEACE AND JUSTICE. THIS IS A TRUE DISRESPECT TO OUR LADY. THIS PARADE OF GRIEVANCES MUST END! OF COURSE THIS IS AN ABOMINATION! THIS HEIGHT OF SCANDAL WAS THE IRREVOCABLE SIGN THAT CAUSED THE GREAT ARCHBISHOP LEFEBVRE TO ACT FLEEING FROM THE APOSTATES AND CONSECRATE IN 1988 IN A VERY POSITIVE MANNER 4-BISHOPS FOR THE LIFE OF THE CHURCH TO CONTINUE FOR FUTURE GENERATIONS TO GIVE THE TRUE FAITH.